The popular saying laughter is the best medicine could have been written for cat owners. One of the biggest health benefits of allowing a cat to join your household is that you will never stop laughing – the popularity of cat videos on the internet and programs like Cats Make You LOL, are testament to this fact – cats are funny! Cats do make you LOL! According to market research there are around two million different videos of cats posted on YouTube and each one gets an average of 12,000 views – that’s a grand total of nearly 25 billion views! So what are the health benefits exactly? Well, having your own cat to laugh at on a daily basis can help to reduce the level of stress hormones in your body, increase the amount of immune cells and help your body to produce more infection-fighting antibodies. Cats bring you back down to earth. You might have had a great day and think you are a super important human being, with a vital job, which no-one else could possibly replace, the head of your own household, and someone who contributes a valuable role in society. But just one look from your cat will bring you right back down. So what is the health benefit of this you might ask? Well, it’s about balance in life and reducing that feeling of burden and responsibility which we all carry around with us every day. One look from your cat and you are no longer a tense manager with the weight of the company on your shoulders, your only responsibility is to open the tin and feed the cat – you have no other role in life. Cat purring is actually beneficial for us physically according to medical research reports published recently. The research showed that the purring noise is therapeutically good for us and can benefit humans in a number of different ways, and it has even been proving that the sound of a cat purring near to us, can actually lead to improvements in several health conditions. A cat purring within a range of 20-140 Hertz, will create therapeutic benefits for humans who are nearby. The sound has been connected with reducing stress symptoms, lowering the likelihood of a heart attack and even making bones stronger. Although part of the negative reaction to cats is often tied to people’s fear of having an allergy of them, the opposite can also be true, particularly for children. Being brought up with animals in the house, cats in particular, has been shown to reduce levels of allergies in babies. Having a cat actually reduces your child’s risk of having asthma. Studies have shown that if you are about to have a baby, having pets is actually beneficial for the baby, as being around the pets from an early age can trigger their immune system and prevent the allergies from developing in the first place. There is even evidence that living with cats can also prevent children from developing asthma. One of the key benefits of owning a pet is proven stress and anxiety reduction. Owning a pet gives you something to think about other than yourself, not to mention having a gorgeous furry cuddle monster to curl up with in the evenings, particularly if you live alone. Pets give us unconditional love, even allegedly aloof and distant-seeming cats. Having a cat has been proven to release stress and anxiety as caring for something else takes your mind away from your own troubles and concerns. Not only that, but stroking and petting an animal is very calming and soothing for anyone. As well as reducing stress and anxiety levels, cat ownership has been shown to have a beneficial impact on people suffering from depression or from loneliness, perhaps following a bereavement or a life-changing situation such as a divorce or messy break-up. Cat ownership may not immediately spring to mind as a depression treatment but studies have proven otherwise. Obviously cat care can’t actually cure a medical condition, but it can certainly help provide a different focus for sufferers, taking them out of their own head. Companionship can also help in the battle if the depression is caused by loneliness. People with autism suffer from difficulties communicating and bonding with others, particularly true of autistic children, but many studies have shown that another therapy area where cats have been proven to help youngsters on the autistic spectrum to learn to communicate and they have been seen to bond closely with pets including cats, when they struggle to bond with people. There have been many cases of children benefiting from feline therapy, developing their communication through bonding with their cat. It has been shown in studies that children on the autism spectrum, who have pets, are far more social than those without, and talking about their pets also helps them to bond better with other people. Owning a cat can actually lower your blood pressure. Scientific experiments have shown that cat owners frequently have lower blood pressure than those who don’t own cats. It’s not clear why this is the case, other than that perhaps it is linked to the general calming impact and reduction of stress levels associated with cat ownership mentioned earlier. A study was taken held in Russia years ago which proved in a rather bizarre way that cats can lower blood pressure. The study involved getting cat owners to listen to loud music and scream, and then the same thing was done with non-cat owners. The results were very different as the non-cat owners had very high blood pressure increases as a result. Health benefits are not just for individuals – our carbon footprint affects the health of everyone in the world and while we focus on things like cars and pollution, it is all too easy to ignore the carbon footprint caused by our pets. The meat eaten by dogs and the impact of their faeces on the environment is huge. Owning a cat can help us to reduce our pet carbon impact. Cats do impact the environment in terms of the amount of birds they catch and kill and the meat which they eat, however, they have far less of an impact on the environment than dogs do. It has been proven that cat owners are less likely to visit doctors and hospitals, making fewer visits than non-cat owners. Again, it’s not clear why this should be the case, although perhaps all of the other health benefits added together, help lead to this final crucial positive reason to own a cat. The same studies also revealed that nursing homes which used cats for patient therapy, managed to lower their medication bills than those which didn’t have cats. They also showed that cat ownership helped people to live longer. So, from reducing stress to lowering blood pressure and helping people to recover from depression and loneliness, cat ownership has been proven to provide many and varied health benefits to humans, so perhaps it’s time to reconsider their reputation and go out there and embrace the positive benefits of becoming a cat parent. 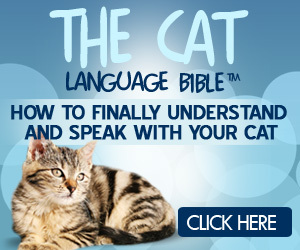 Written by Jonas Jurgella, Ph.D – Animal Communications Scientist, Researcher, and author of the best selling Cat Language Bible (TM): How to Finally Understand & Speak with Your Cat!